We seek God’s blessings upon our rabbi and upon our congregation. may we find in our rabbi a true teacher, guide, and friend. We seek Your blessings on our rabbi. May she be blessed with continued strength of body and spirit. May her frustrations be few and her satisfactions be many. May she find in us a community responsive to her teachings and appreciative of her many efforts on our behalf. We promise her the support of our hands and our hearts. Let Rabbi Meyer succeed in all that she does and may she lead us in wisdom, in righteousness and in faithfulness.
. May God show you favor and be gracious to you, allowing you to grow as a partner in this holy work. May God turn toward you showering you with joy and grant you Shalom, peace and wholeness. Parashat K’doshim places before us one of the most difficult commandments in the whole Torah. 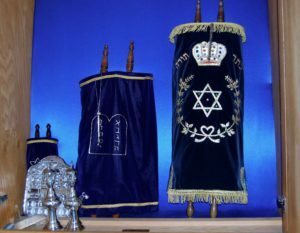 It’s not kashrut or Shabbat, or even the rules of sexual conduct, but rather, the admonition and the expectation to “be holy.” Throughout the Torah, we are given rules and statues that tell us what to do. Here are we told what to be. A similar statement is found in Exodus 19:6, where we are commanded to be a “kingdom of priests and a holy people.” But what does it mean to be holy? The parashah does not define what holiness is, nor does it tell us what it means to be holy. The guidance it gives us is in the specifics: the who, when, why, and how of the injunction. Who is to be holy? The whole people are addressed: in the Hebrew it is kol adat B‘nai Yisrael, “the entire Israelite community.” Not just the priests or Levites; not only the men; but holiness is commanded of everyone. The 16th century commentator Rabbi Moshe Alshich asks: Why are such important rules as the ones that follow upon this verse not taught person by person, group by group? Why to one large assembly? His answer: God instructed Moses to call all the people together when giving them the commandment to be holy in order that it would be clear that holiness is not something achievable by only the few. People should not claim that high standards of morality and ethics are only for the pious, only for the special, only for the elite — they are not. When are we to be holy? The verb tense in verse 2 for the word — tihiyu — is the present imperative/command form, “be [holy],” but also the future form, “you shall be [holy].” Holiness is a daily struggle in the here and now, as well as a future yearning. Why are we to be holy? The compendium of medieval Talmudic commentaries called Daat Z’kanim suggests: “that is exactly what it means by you shall be holy — because God is holy.” The commentator Sforno notes that this verse teaches us we are to remember and act “in the image of our Creator” as much as that is possible. Later philosophers will term this imitatio Dei. We try to “imitate” the Divine. As God cares, so do we. As God sanctifies the Sabbath, so do we. In our parashah, however, we have a new twist on this idea. In much of Torah it is God who makes things holy, and God who sanctifies. We read in Genesis 2:3, “and God blessed the seventh day and made it holy,” but in K’doshim the command to make things holy is put upon us, upon humankind. The task of sanctifying our lives is given back to us as an act of partnership between us and God. The concept of separation is critical to understanding Jewish spirituality, and it is central in K’doshim. The word kadosh, “holy,” itself carries the idea of separateness. For example, in the marriage vows, the phrase harei at mikudeshet li, means both “behold you are sanctified to me” and also, “you are set apart for me from other potential spouses.” In the Talmud, hekdeish is money or goods set aside, separated for tithing or donation. 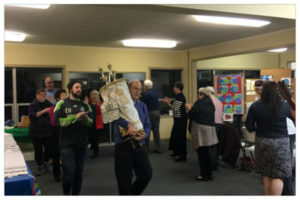 Holiness seems intrinsically linked in Judaism to separateness, to distinctions: milk or meat, Shabbat or weekday, Jew or gentile, male or female. A wonderful dichotomy now emerges. If holy means separate, a person might be led to believe that in order to become holy we must withdraw and remove ourselves from community. Yet this section was taught publicly, to communicate to us that the holiness we seek is found in community. If to be holy is, in some way, to be separate, then how can we do that together as a community? That is why k’doshim tihiyu — “you shall be holy” — is one of the most difficult commandments in the Torah. It asks us to celebrate the Divine speak within each and every separate individual, accepting that their separateness is part of their spirituality, and yet to consciously and purposefully — and always — frame that unique individuality within the enveloping shelter of the greater community. In today’s society of the self, that may just be harder to do than any other mitzvah. Rabbi Elyse Goldstein is the founding rabbi of City Shul, downtown Toronto’s new Reform congregation. Before that, for twenty years, she was the director of Kolel: The Adult Centre for Liberal Jewish Learning. She is the author/editor of four books on women and Judaism (published by Jewish Lights Publishing).